Measures should be implemented that bring the generations together. In Manchester, mayor Andy Burnham and others have established Age Friendly Manchester, a partnership that works across public, private and community sectors to improve the quality of life of older people and to put in place activities and programmes to unite the generations. I visited one such project co-run by Manchester Cares in Levenshulme where younger and older neighbours are given a chance to learn from one another, to laugh, to tell stories and to build the types of friendships and social networks that really matter in life. 24,584 people nominated and the results are finally in for the National Diversity Awards (NDA), with an astonishing 124 nominees being recognised for their various achievements nationwide. 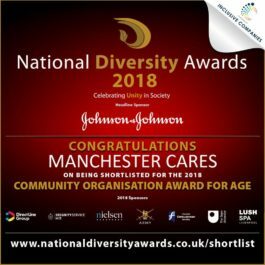 Community organisations and role models will head to the breathtaking Liverpool Anglican Cathedral on September 14 to witness the 2018 winners being crowned the best of British diversity. Last month, That’s Manchester featured Manchester Cares in a short film about fighting back against loneliness and isolation, alongside older neighbour Tommy (83). Tommy talked about how a distance from others “breeds that melancholy that just overtakes you” and “eats away at you” over time. Through our nascent Social Clubs, Love Your Neighbour and Outreach programmes Manchester Cares has started to tackle this isolation and loneliness amongst older people and young professionals alike in the city of Manchester. The nature of the isolation older and younger groups face is very different. For many older people, retirement, the loss of social networks, bereavements, single living and failing health all play a role. For younger people, professional expectations, social media, FOMO (fear of missing out), and living and working with people largely from similar backgrounds and world views, can all bring a sense of being unfulfilled. It’s in our fast-changing cities where the crisis is most pronounced. Globalisation, gentrification, migration, urban transience, digitisation and housing bubbles have all contributed. The multiplying effect is that many older people have deep roots in their communities but few connections, while many young people have hundreds of connections but no roots in communities.